I got a question: “Can I create multiple VMs for a given component?”. Imagine you have an application component that needs extra VMs if some policies are set! 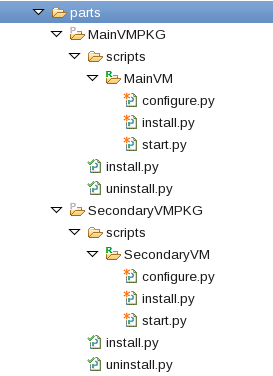 I don’t want to bother the pattern designer with some extra rules and tell him “if you define this policy you absolutely need to add an extra VM in order to manage this policy”. In this article, I will explain how to create an extra VM if the scaling policy is defined for the component. "description": "Description for the Slave scaling policy." "description": "Specifies the number of cluster members that are hosting the web application. The default value is 1. Acceptable values range from 1-n."
In the config.json we have to define the packages that will be use to deploy the 2 VMs. In this topology, you can see that we test if the scaling policy is set to create the secondary VM. and update the MANIFEST.MF to add this new service. This entry was posted in IBM PureApplication System, IBM PureSystems, IBM SmartCloud Application Services and tagged #ibmcloud, #puresystems, #SCAS, #SCAWS by ITDoVe. Bookmark the permalink.